In a 2007 article about the then-three-year-old Facebook, Mark Zuckerberg declared, “I’m here to build something for the long term. Anything else is a distraction.” At the time, he wasn’t planning to follow the “exit strategy” example of the many other tech founders who built up their companies and then sold them for huge amounts of money. Ten years later, his stance hasn’t changed (even though the company went through a very successful IPO in 2012 and today has an annual revenue over $27 billion). Zuckerberg is definitely in it for the long haul. Access issues of HR Insights for more Human Resources trends and topics. For example, Amazon’s official mission is “to be Earth’s most customer-centric company; to build a place where people can come to find and discover anything they might want to buy online.” When Amazon first announced it would start selling hardware (Kindle tablets and e-readers), I first thought this venture was a distraction from the company’s mission. Then I realized that it actually directly supported that mission, because nearly all of the purchases made on those devices would be from Amazon. On the other hand, remember the BlackBerry? Not that long ago it totally dominated the mobile phone market. Today, though, the company is barely clinging to existence and holds just 0.0481% of the market. There are analyses galore about how this happened, but most of them boil down to the same observation: the company rested on its laurels and failed to engage in actions that promoted its mission (probably, in part, because the company never clearly articulated what that mission was). 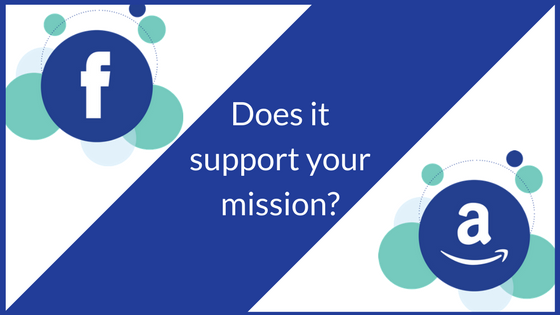 So the next time you need to hire, fire, create a new position, expand into a new market, or take any other business-oriented action, ask yourself, “Does this decision support the company’s mission?” If the answer is “no,” you may want to reconsider that action. And if the answer is “I’m not sure,” it may be time to tune up your mission statement and make sure everything your company does connects to it. Mike McKerns, SPHR, is the editor in chief of HR Insights and cofounder of Mamu Media LLC. He can be reached at editor@mamumediallc.com.